Places of higher and liberal learning, so called from the Latin word "universitas," signifying an association or a corporation. There are traditions of the connection of Jews with the medieval universities of Salerno and Montpellier (see Medicine) and with that of Oxford. No Jewish names are connected with the development either of the southern (Bologna) or the northern (Paris) type of university from the twelfth century onward. A degree or right to teach seems to have been regarded as a feudal tenure; and the acceptance of a degree was always accompanied by payment of homage to the rector or councilor. Such homage involved the recital of Christian formulas, which Jews could not recite. Besides this the twenty-fourth canon of the Council of Basel (1434) distinctly prevented Jews from taking any academic degree. A distinction, however, is to be made between the faculties of theology, philosophy, and law and that of medicine. Jews would naturally not study in the first of these, and they could scarcely work at medieval law, which was as much canonical as civil, while the philosophical faculty was mainly a development of the Christian metaphysics of Thomas Aquinas. But Jews appear to have studied, and even to have taught, in the medical faculty; thus, Elijah Delmedigo was professor of medicine at Padua at the end of the fifteenth century. As late as 1700 the universities of Rostock and Wittenberg counseled the Christians against employing Jewish physicians, who probably practised without taking a degree. Most of the Jewish doctors whose academic training can be traced received such training at Padua. With the revival of learning, scholars of Jewish birth, mainly those who accepted baptism, were utilized for the chairs of Hebrew in the various universities, as in the case of Tremellius at Cambridge, etc. This practise was continued almost down to the present time, and spread to the whole circuit of the Semitic languages, in which Jews, from their proficiency in Hebrew, have a large opportunity. In Holland rigid restrictions on university training do not seem to have existed, though there were fewnames of Jewish students recorded till the nineteenth century. So, too, in Austria, the toleration edict of Joseph II. plainly declared that there was no express law against the admittance of Jews into the Austrian universities; but the fact of its being thus mentioned is sufficient to indicate that the admission had either not taken place or was extremely rare. In France the Revolution opened the higher schools of learning to the Jews; but in England they shared the disabilities of all dissenters, and were prevented from taking degrees. Thus, Professor Sylvester, though second wrangler in the mathematical tripos at the University of Cambridge in 1837, did not obtain a degree there till 1872, after the passing of the University Test Act (1871), which was partly caused by the attainment of the senior wranglership by Numa Hartog in 1869. 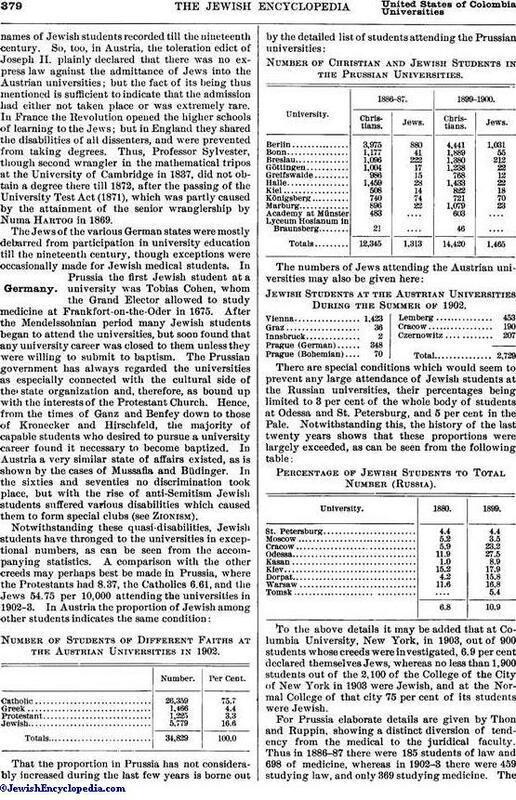 The Jews of the various German states were mostly debarred from participation in university education till the nineteenth century, though exceptions were occasionally made for Jewish medical students. In Prussia the first Jewish student at a university was Tobias Cohen, whom the Grand Elector allowed to study medicine at Frankfort-on-the-Oder in 1675. After the Mendelssohnian period many Jewish students began to attend the universities, but soon found that any university career was closed to them unless they were willing to submit to baptism. The Prussian government has always regarded the universities as especially connected with the cultural side of the state organization and, therefore, as bound up with the interests of the Protestant Church. Hence, from the times of Ganz and Benfey down to those of Kronecker and Hirschfeld, the majority of capable students who desired to pursue a university career found it necessary to become baptized. In Austria a very similar state of affairs existed, as is shown by the cases of Mussafia and Büdinger. In the sixties and seventies no discrimination took place, but with the rise of anti-Semitism Jewish students suffered various disabilities which caused them to form special clubs (see Zionism). Number of Students of Different Faiths at the Austrian Universities in 1902. Number of Christian and Jewish Students in the Prussian Universities. Jewish Students at the Austrian Universities During the Summer of 1902. Percentage of Jewish Students to Total Number (Russia). To the above details it may be added that at Columbia University, New York, in 1903, out of 900 students whose creeds were investigated, 6.9 per cent declared themselves Jews, whereas no less than 1,900 students out of the 2,100 of the College of the City of New York in 1903 were Jewish, and at the Normal College of that city 75 per cent of its students were Jewish. For Prussia elaborate details are given by Thon and Ruppin, showing a distinct diversion of tendency from the medical to the juridical faculty. Thus in 1886-87 there were 185 students of law and 698 of medicine, whereas in 1902-3 there were 459 studying law, and only 369 studying medicine. Thepercentage of Jews among the law students remained practically the same at 9 per cent, whereas that of medical students declined from 19.6 to 15. In philosophical faculties a rise in numbers took place from 246 in 1892-93 to 392 in 1902-3. In the latter year Jews formed 4.5 per cent of the students devoted to philosophy, 5.6 of mathematicians, 2.9 of economists, 9 of pharmacy, and 26.9 of dentistry. The numbers of professors of the Jewish faith are rarely given authoritatively. 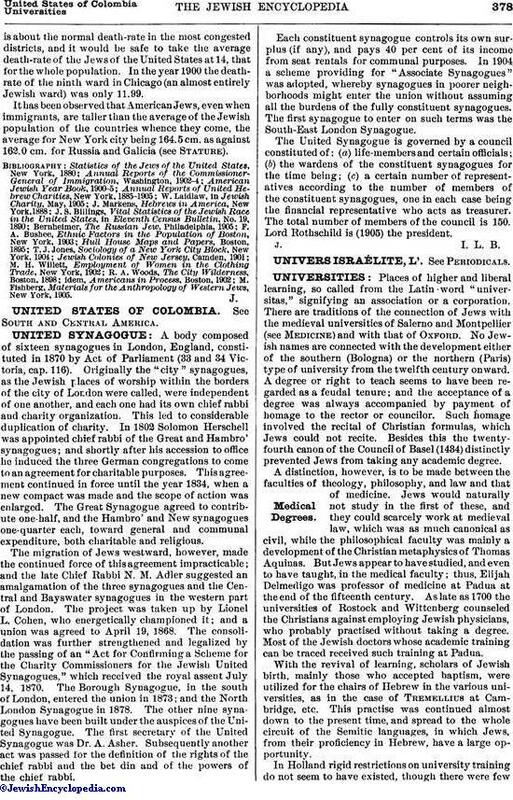 Servi recorded that in Italy in 1867 there were seventeen Jewish professors at the Italian universities ("Statistica degli Israeliti," p. 298). About 1880 it was said that there were six ordinary and twenty extraordinary professorships and twenty-nine readerships held by Jews at Berlin University, as compared with sixty-one, fifty-three, and fifty-seven respectively by Christians. 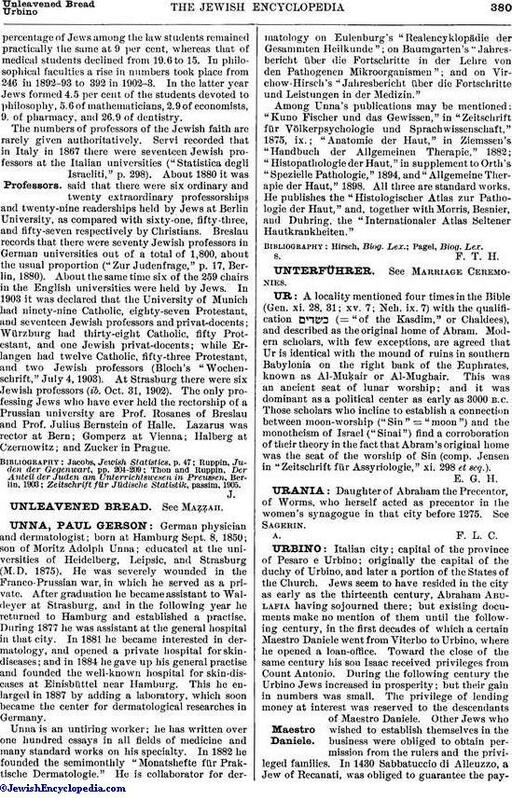 Breslau records that there were seventy Jewish professors in German universities out of a total of 1,800, about the usual proportion ("Zur Judenfrage," p. 17, Berlin, 1880). About the same time six of the 259 chairs in the English universities were held by Jews. In 1903 it was declared that the University of Munich had ninety-nine Catholic, eighty-seven Protestant, and seventeen Jewish professors and privat-docents; Würzburg had thirty-eight Catholic, fifty Protestant, and one Jewish privat-docents; while Erlangen had twelve Catholic, fifty-three Protestant, and two Jewish professors (Bloch's "Wochenschrift," July 4, 1903). At Strasburg there were six Jewish professors (ib. Oct. 31, 1902). The only professing Jews who have ever held the rectorship of a Prussian university are Prof. Rosanes of Breslau and Prof. Julius Bernstein of Halle. Lazarus was rector at Bern; Gomperz at Vienna; Halberg at Czernowitz; and Zucker in Prague. Zeitschrift für Jüdische Statistik, passim, 1905.